As founder and past president of the American Academy of Child and Adolescent Psychiatry and president of the American Association of Children's Residential Centers, Joseph Noshpitz was at the forefront of psychodynamic treatment and research with children and adolescents for more than forty years. He was the editor-in-chief of the six volume Handbook of Child Psychiatry, co-author of the two volume Pathways of Growth: Essentials of Child Psychiatry, and co-editor of Stressors and the Adjustment Disorders. His breadth of knowledge and wisdom ranged well beyond the traditional areas of diagnosis and therapeutic interventions, envisioning the child as an individual within the family and the wider culture. Based on psychoanalytic ideas and without jargon, Noshpitz's innovative ideas are grounded in the developmental theories of Freud, Mahler, and Kernberg. 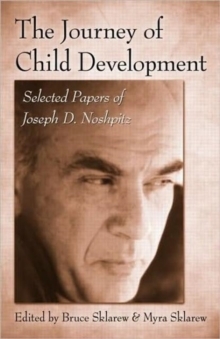 These previously unpublished papers demonstrate Noshpitz's scope and the depth to which he conceived the psychic life of the child. Each paper is introduced by experts who contemporize and contextualize the work for the modern reader. The wide-ranging papers include ethics in child development, narcissism in the grade school years, tomboyism, idealization, negative ego ideals, and self-destructiveness in adolescence. More applied papers delve into the formative appeal of literature for adolescent girls, the developmental lessons of the Ninja Turtles, and the creative early motivations behind art, music, dance, mime, and poetry. The papers present an unyielding advocacy for the progressive development of the child interacting with the society at large, most evidenced in the extraordinarily far-reaching proposal for wider preventive family interventions. As poignant now as the time when they were written, Noshpitz's thoughtful commentaries and analyses repeatedly demonstrate his intrinsic curiosity, joy of learning, generosity and sensitivity to the myriad struggles of youth. His psychodynamic sensibility is a contrast to this era of quick psychopharmalogical fixes, cognitive-behavioral approaches, and managed care. To learn more about the life and work of Joseph Noshpitz, and to access more of his unpublished work, please visit http://josephnoshpitz.com.